From Why, we went to Benson, Az. for a week. We took day trips down to Tombstone and Bisbee. Tombstone was pretty neat with all the old buildings and, of course, the OK Corral. In Bisbee we toured an old underground copper mine, and looked into the giant open pit mine. From Benson AZ we headed east on I-10. I got to drive the motorhome!!! Actually, it seems more like herding the motorhome. It was pretty windy. We stopped for a couple of days at Junction, Tesas. The campground was very nice, in a pecan grove. It was so nice to see trees again, after four months in Arizona among the cactus. Now we are in San Antonio, Tx. We are staying at the KOA in town. We didn’t know there was a rodeo/stock show going on. The campground was full of cowboys, but they did have room for us, even without a reservation. The city bus stops right in front of the KOA so we took the bus to downtown and saw the Alamo, had lunch at a restaurant on the Riverwalk, and took a ride on one of the tour boats on the San Antonio River. The weather was brisk, but it was enjoyable nonetheless.We will be here until the 22nd, then head up to visit Richard’s sister near Dallas. Fair warning to all our friends in OKC: Richard has a Dr. appointment in OKC on March 13th, and gorgeous grandson Shane’s birthday is the 11th, so we will be up there then. 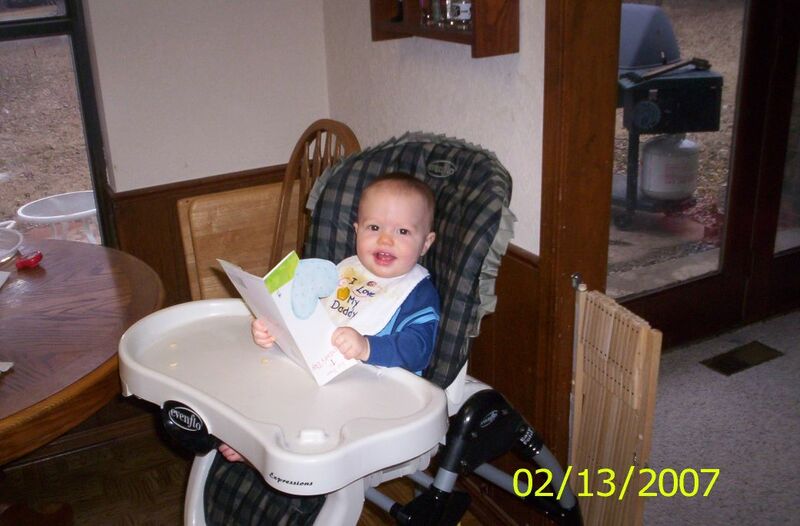 Speaking of the gorgeous grandson, I have attached a couple of pictures of him reading the valentine I sent him. 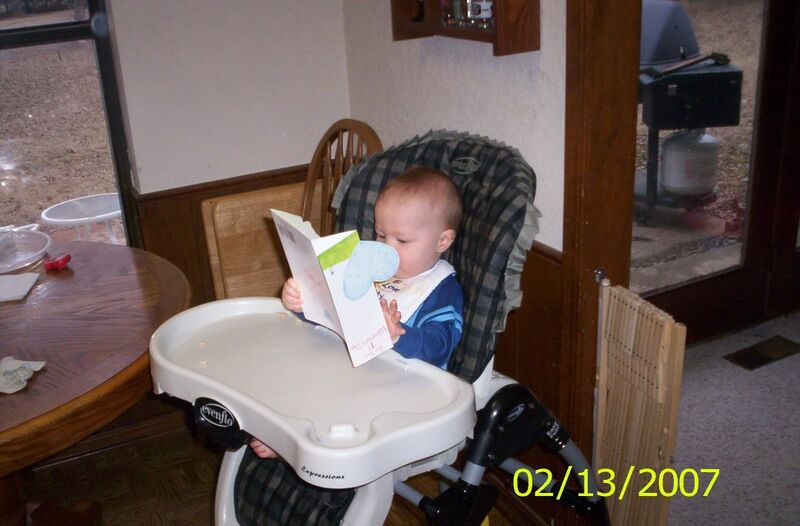 You can tell he is brilliant–not even one year old yet and he can read upside down!! What a truly talented child he is! !